Happy Reformation Day! 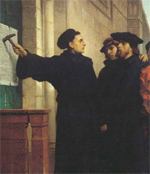 It was 499 years ago today that Martin Luther nailed his 95 theses to the door of the church. We consider October 31, 1517 the day that the protestant reformation was launched, a protest against Roman Catholicism and to reform the church back to its originally intended purpose. We're hosting a Reformation Day party tonight from 6:00 to 8:00 at the church. Food, games, prizes, and candy! Come dressed up! Renaissance costumes are suggested, but if your child wants to come as Spider-Man, that's okay, too. Enter through the front door. We'll be in the sanctuary. Here's some pictures from the renovations we've been doing at the church this past week! It's still going to look like a work-zone on Sunday, but everything will still be held at its usual times. Sunday school is at 9:30, worship service at 10:30. 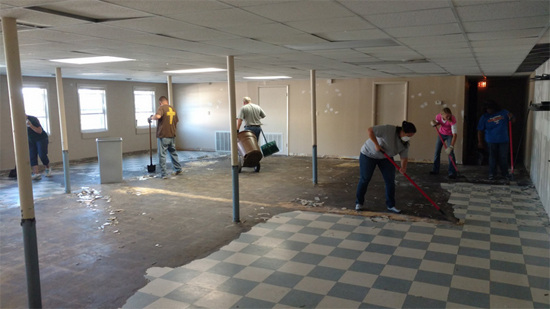 Thank you to Northland Community Church in McBain, MI (pictured at the bottom) who helped with all of our renovations this week. What a blessing they were! And thank you also to our volunteers, whether you worked, cooked a meal, or housed a visitor. We still have some work to finish up. Ask how you can help! Greetings, family! This Sunday, we will be having a potluck downstairs in the Fellowship Hall after service. Ramon and Kasey are providing the entree. We're asking everyone to bring either a side or a desert to contribute. Pastor Gabe is going to be preaching on the Doctrine of the Resurrection as we continue our Essential Doctrines series. Worship is provided by our special guests, the Spencer Family (video below, singing "Come Thou Fount"). Sunday school is at 9:30 and the service is at 10:30. We look forward to being together on the Lord's Day! On Saturday, from about 9am to 4pm, we'll be having a workshop to design and build pinewood derby cars for our AWANA Grand Prix! We've got all the tools and the hands to help make them. Also the paint and supplies to decorate your car. The cost is $5 per car. Parents, you're welcome to build one, too! Come park around back and enter through the double-doors. Today as we continue our series through essential doctrines, we'll be talking about the inerrancy of the Scriptures. How do we know that the Bible that we have is true? How do we know that the books of the Bible that we have are the books that we need to have? We'll be talking about some of these things today, coming to understand the authority of the word of God.